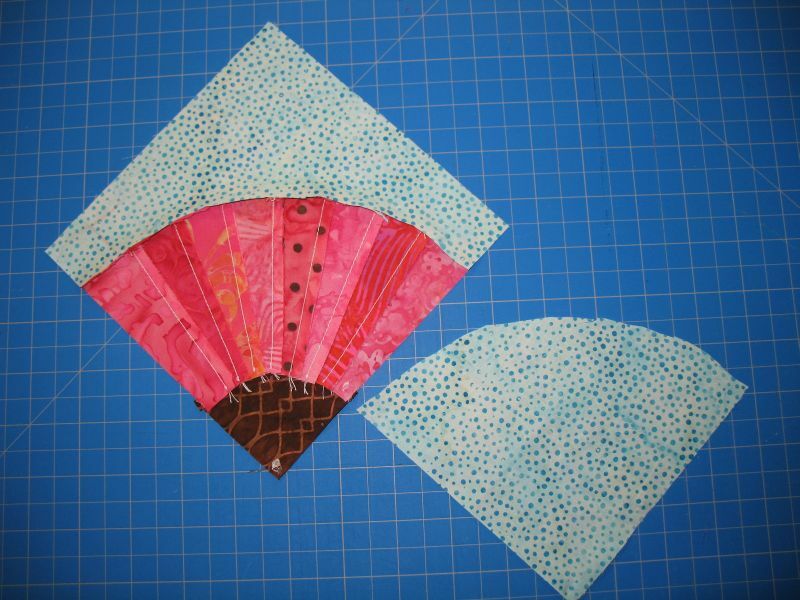 Old Fashioned Fan Quilt & Block Tutorial! Several years ago a co-worker asked me to repair his great-aunt’s Fan Quilt. 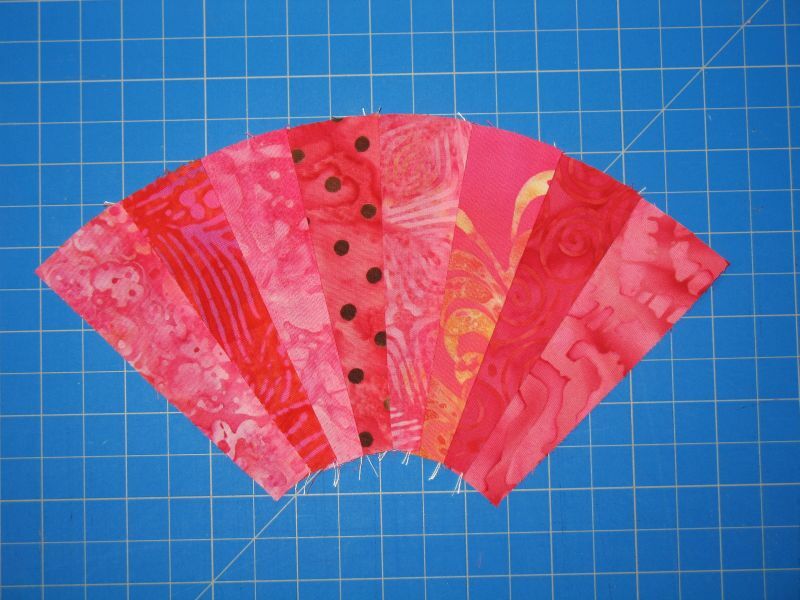 I fell in love with the beauty of the scrappy fabrics and fans. It’s a simple block but in it you can see the history of her journey in the scraps from clothing to feedsacks. I have created 3 PDF’s for this block in various sizes. 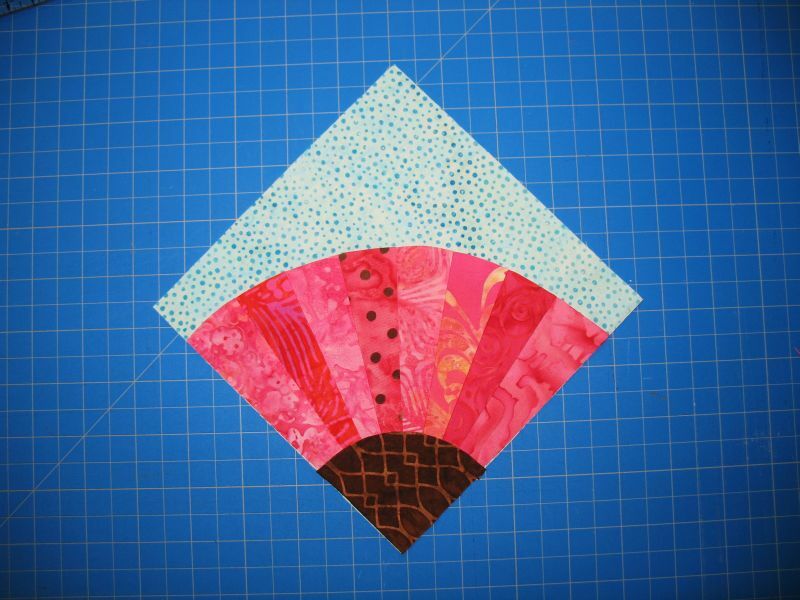 Feel free to download and create your own fabric journal Fan Quilt. Maybe you have baby clothes or family members’ clothes set aside for just such a project! 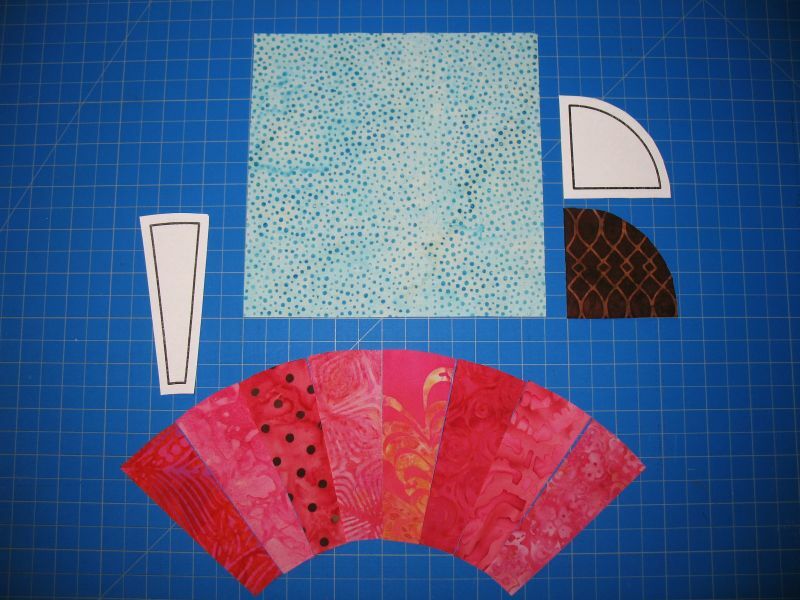 For all block sizes in the pdf’s you will need to cut your background squares according to your block size choice, 1/2 inch bigger than your desired finished size if you plan on using this beginner’s tutorial. Example: for a 6 inch finished block, cut a 6.5 inch background square. For an 8 inch finished block size, cut your background square 8.5 inches and so on. Reader Marion vonS asked for a beginners tutorial for this fan block so here you go Marion! You will not need the long curved background piece for this technique. Next, sew your blades together with an accurate 1/4 inch seam. Press the seams open or to one side, whichever you prefer. 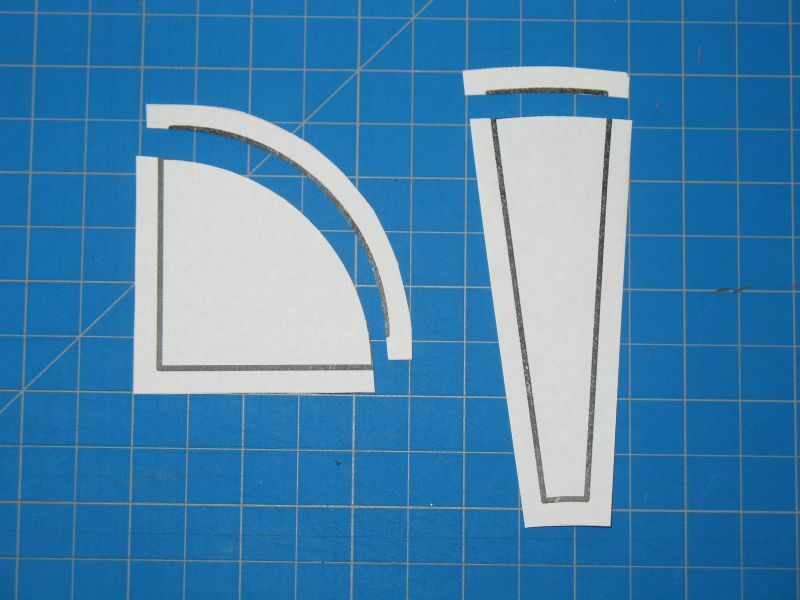 Once you have your blades sewn together, the top curved edge will need to be pressed under 1/4 inch as well as the curved edge of the quarter circle. I took my template pieces and cut the top seam allowance off of them to use as a pressing guide to make sure the pressed portion is accurate. This pic shows how the curved edge is pressed under. The picture below shows the edges pressed under to the backside of the blades and quarter circle. It’s time to put your block together! I dug out my trusty gluestick and glued the curved edges down once I had both the blades and quarter circle situated on the background square. You can use pins but I love using the gluestick! Get both pieces situated on the background square, glue or pin and now you can either hand stitch the large arc of the blades or use a small zigzag stitch or decorative stitch on your sewing machine to stitch the arc down. Before you move on to sewing the smaller arc on the quarter circle, now is the time to trim out the excess background fabric. Make sure you have your little quarter circle secured onto the fan before you do this. If you don’t it can be a pain to get just right to ensure that your block is nicely square. 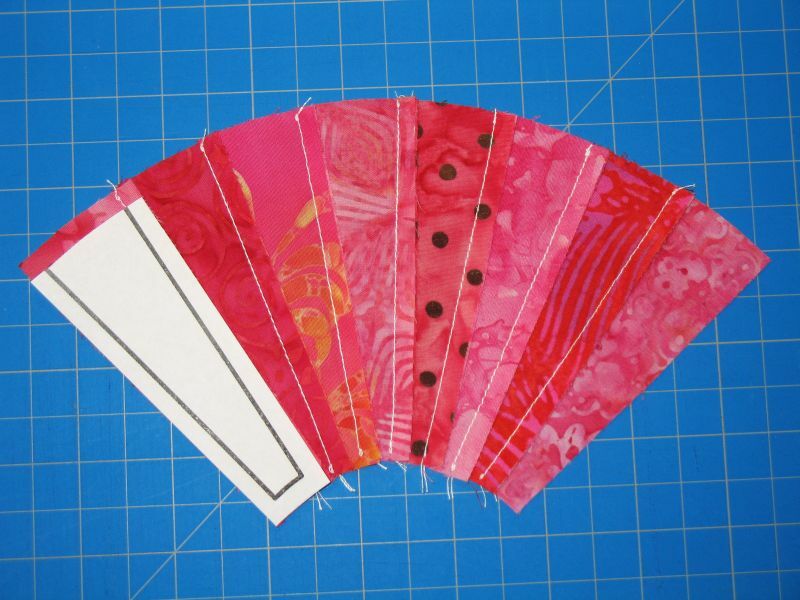 You can choose to leave the excess background square fabric behind the fan alone or carefully trim it out. Leaving it in generally won’t add a lot of bulk to the seams as you sew your fan blocks together but it might create a bit of a seam bump. After you’ve trimmed out the excess, you can now hand stitch or machine stitch the little arc of the quarter circle onto the fan itself. That’s it! your block is done! If anyone would like a particular size that is not listed, just give me a holler and I can make you a PDF in a few seconds. Happy Stitching! Not a quilting question, but a cleaning one. What did you use to clean the quilt? A co-worker has brought me a “quilt” her grandmother made years ago (cathedral window, but it’s only a top – no backing, no batting) that is stained from years of use. because of the material content (sheets and scraps of clothing made from every conceivable fabric) I know I don’t want to throw it in the washer. What do you suggest? I’d baste it to a sheet or something before washing it. I’ve always heard that you should never wash a quilt top before it’s either secured to a sheet or made into a quilt. Then I’d wash it by hand in the bathtub. I use Purex liquid laundry detergent. Thanks for your tutorial. I have some fabric I have been reluctant to cut up as the pattern is so large and wonderful. I decided to make a quilt using one repeat of the fabric and needed to do some patchwork on the top. 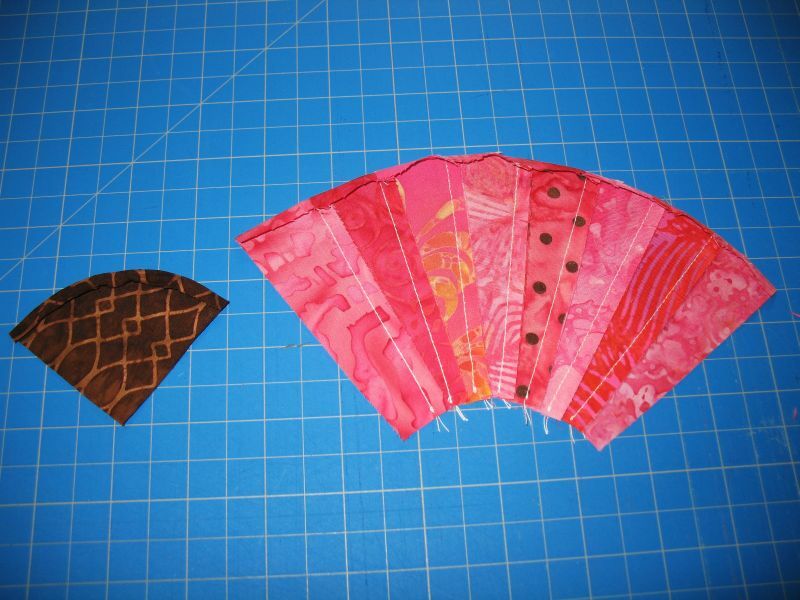 I am planning on doing at least ten 6″ Chinese Lanterns and now I will add 10 or so 6″ fan blocks as well. Flying Geese will finish off the quilt, I hope. Could be a real mess as I am a beginner who just loves fabric. Once again thanks. I am using this for my first attempt at Grandma Fan. Best instructions I found on the internet and templates for different sizes was just what I needed without buying a ruler tool. BTW: I am using these as an oriental panel accent. Can’t wait! Hi! I’m so glad I found this tutorial. My friend bought a box of assorted vintage pieced quilt parts at an auction. I have determined that I have a lot of these fans but they are 9″ . Could you possibly make me the template for 9″ so I can make the curved backgrounds? Thank you. Prior to your blog about it I had no idea what I was going to do with these things! What a great tutorial, thanks! Any chance you have a 10 inch template you could send me? Much appreciated.